iPhone / iPad users click here to listen. We spend one third of our lives sleeping (or at least lying there, hoping to sleep). This is time you can never get back. Sleep is a necessary investment of your time to heal, rest, and rejuvenate. But what if you lie there in bed unable to sleep? You get no return on your investment. Houston – we have a problem! Isn’t it about time you started enjoying a good night’s sleep? We don’t want you to just get the occasional good rest. No. We want you to enjoy a restful sleep every night! Why has it become a badge of honor to brag about how little sleep we get? Is that really helping us feel better? Of course not. If you aren’t getting enough sleep, you will pay a price in reduced efficiency, immune suppression, irritability, and generally poor function. Over the years, Mike Mandel has treated many people for sleep dysfunction. Some had long-term problems and others suffered from occasional insomniac episodes. He found it strange that some people fell asleep rapidly and others lay awake for an hour or more before they finally dozed off. Others fell asleep readily, but then awoke at 3 AM and lay awake for hours before finally falling asleep from exhaustion, just before their alarm went off. Which of those scenarios do you relate to? Or are you dealing with more than one of those problems? Regardless why you have difficulty sleeping, Mike Mandel’s new program A Good Night’s Sleep can solve your insomnia and other sleep problems. If it doesn’t, you get your money back (as always with any products we sell). Mike Mandel has combined in-depth research and his own considerable experience in dealing with sleep problems. A Good Night’s Sleep attacks insomnia with multiple tools. 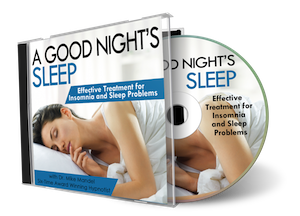 As a world-renowned hypnotist, Mike Mandel gives you two separate hypnosis tracks to help you you solve solve your sleep problems, and he doesn’t stop there. The training track will teach you all you need to know about sleep disturbance and how to overcome it quickly and easily. You’ll learn why insomnia occurs and what you can do to head it off before it even happens. A PDF transcript of this training track is also included for convenient reference. Many of you will find that this track, alone, will give you the tools you need to completely fix your insomnia or sleep problems. Hypnosis track #1 gives you the ability to power nap at will, whenever you need a break. You’ll rapidly gain the skills that will enable you to recharge your batteries in just 10 or 15 minutes, anytime you want to. After just 3 listenings, you’ll be able to create the power nap state without the recording. Hypnosis Track #2 helps you fall asleep, directly. It is specifically designed to generate a relaxed state and transition that relaxation into sleep. You’ll use this at bedtime, or to fix all of those times when you wake up in the middle of the night wondering “how long will it take to fall back asleep this time?” This track helps you solve middle-of-the-night insomnia by slowing your brain down and letting you drift off into a deep refreshing sleep. The bonus video track teaches a simple and remarkably effective method of energy tapping that Mike Mandel uses himself to great effect. Do you find you can’t sleep because your mind is racing? Maybe you worry about problems at night, which disturbs your sleep. If so, this method will help you mentally shut down in only a couple of minutes. Restful sleep is then easy to enjoy. This product is delivered in our gorgeous members area. You will be able to listen online (streaming) or download all files to your computer / mobile device. Remember to never listen to any hypnosis track while driving, operating machinery, or doing anything else that requires your full attention. If you are not getting the sleep that you deserve and desire, then it’s time to try something new. You’ll learn to sleep restfully or we’ll refund your money.